Ancestry Father: William Allen, Sr.
Born in Philadelphia in 1704, Allen was the son of William Allen, sr., a successful Philadelphia merchant of Scotch-Irish descent who had immigrated to America from Dungannon, County Tyrone, Ireland with his brother John and father. The elder Allen had risen to prominence through close ties to William Penn, proprietor of Pennsylvania. As a youth, Allen spent much of his time in England. In 1720, he was admitted to the Middle Temple in London to study law, and at the same time became a pensioner at Clare College, Cambridge. 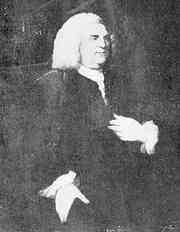 Upon his father's death in 1725, Allen returned to Philadelphia to manage the family's business interests. In 1730, he purchased, at his own expense, the property on which the Pennsylvania State House, later known as Independence Hall, was to be erected. He was made mayor of the city of Philadelphia in 1735, and celebrated the opening of the nearly complete State House the following year by having a feast for all citizens and guests of the city—a celebration that was described as "the most grand, the most elegant entertainment that has been made in these parts of America." In 1734, Allen married Margaret Hamilton, daughter of Andrew Hamilton, famed defense lawyer in the 1735 Zenger case, and sister of James Hamilton. William and Margaret had six children: John, Andrew, James, William, Anne, and Margaret. Like their father, Allen's sons became loyalists in the American Revolution. Allen served as Chief Justice of the colony's Supreme Court from 1750 to 1774, at which time he resigned due to increasing tensions resulting from his loyalist beliefs and health concerns. He was succeeded by Benjamin Chew. In 1760, encouraged by William Smith, Allen sponsored the young painter Benjamin West's trip to Italy, establishing a £100 line of credit on which West could rely and, in a letter of introduction in 1760, calling him "a young ingenious Painter of this City, who is desirous to improve himself in that Science, by visiting Florence & Rome." A year later Allen and his brother-in-law, the Governor James Hamilton, provided more money for West, who would turn out to be one of the century's most important painters and, from 1792 until his death in 1820, the president of Britain's Royal Academy. West referred to Allen as "the principal of my patrons." Allen was a Freemason and a member of St. John's Lodge No. 1, "Moderns," Philadelphia, known as the Tun Tavern Lodge. He was appointed Provincial Grand Master of Pennsylvania, "Moderns" on June 24, 1731, and is recognized not only as the first Grand Master of the Grand Lodge of Pennsylvania, but also the youngest (he was 26 years old when installed). Allen served two terms as Grand Master, the first from 1731–32, the second from 1747-61. A loyalist, he went in 1774 to England, where he published The American Crisis: A Letter, Addressed by Permission of the Earl Gower, Lord President of the Council, on the present alarming Disturbances in the Colonies, which proposed a plan for restoring the American colonies to crown rule. Allen returned to Philadelphia in 1779, and died at Mount Airy, his mansion outside Philadelphia, the following year. From 1867 to 1905, it was also the home of Muhlenberg College.Allentown, Pennsylvania was laid out as Northampton Town in 1762 by Allen. The property was part of a 5,000-acre (20 km2) plot Allen purchased in 1735 from his business partner Joseph Turner, who had acquired the land from Thomas Penn, son of William Penn. Allen hoped that Northampton Town would displace Easton as the seat of Northampton County and also become a commercial center due to its location along the Lehigh River and its proximity to Philadelphia. Allen gave the property to his son James in 1767. Three years later, in 1770, James built a summer residence, Trout Hall, in the new town, near the site of his father's former hunting lodge. On March 18, 1811, the town was formally incorporated as a borough. On March 6, 1812, Lehigh County was formed from the western half of Northampton County, and Northampton Town was selected as the county seat. The town was officially renamed "Allentown" in 1838 after years of popular usage. Allentown was formally incorporated as a city on March 12, 1867. Today, Allentown is the third largest city in Pennsylvania. Allentown's William Allen High School, Pennsylvania's third largest public high school, is named in his honor. Allen built a mansion and country estate on Germantown Avenue in 1750, and the area eventually took the estate's name, Mount Airy, as its own. The estate stood on what is today the campus of the Lutheran Theological Seminary at Philadelphia. Allens Lane, a street in Mount Airy, is also named in his honor.